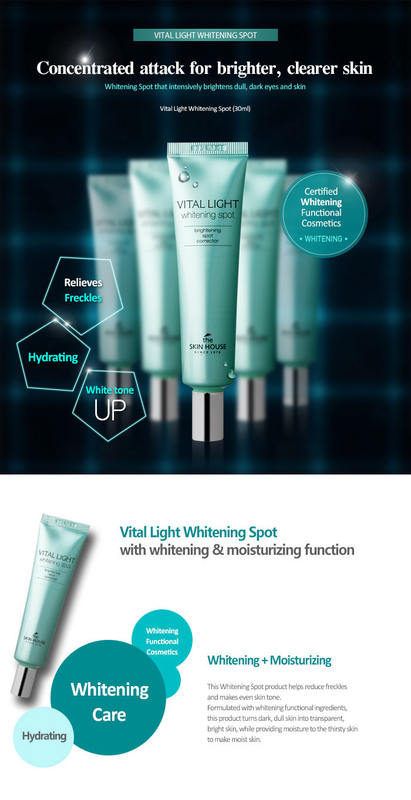 Vital Light Whitening Spot cares the dark spot and has a moist texture. It is whitening spot care product which helps to reduce the freckles when applied on the dark spot, and the niacin amide ingredient effective for whitening makes the dark skin clear and bright. The reason you need dark spot eraser is that the skin of the cheekbone which is commonly called the apple zone is thin and dry so that it is easy to form freckles, and if this part is dark and uneven the whole face looks dark. That’s the reason why moisture supply and whitening care is essential! This spot treatment for the affected part that makes the uneven skin tone even is effective for dark circles, freckles and blemishes. Just tap it to the dark spots! 1. Apply an adequate amount of it before the cream step on the dark spot, and tap it to be absorbed. *You can feel the synergy effect by using it with the whitening Line products (Crystal Whitening Line, Lavender Line) together.